Physicians Committee for Responsible Medicine (PCRM) physicians called attention to the real cause of the nationwide salmonella outbreak by literally spelling out “It’s the meat, stupid!” with more than 1,000 tomatoes. The event, which took place in July in front of the U.S. Department of Health and Human Services building in Washington, D.C., highlighted the role of meat industry pollution in spreading salmonella, E. coli, and other foodborne pathogens that affect thousands of Americans every year. A dangerous salmonella strain has sickened more than 1,000 people across the country over the past few months. The Food and Drug Administration, an agency within the Department of Health and Human Services, spent months trying to determine the source. PCRM used the tomatoes to point out that pollution from animal agriculture—not produce—is the most likely original source. Salmonella, like E. coli, live in the intestinal tracts of animals and are usually transmitted to humans from food contaminated with animal feces. This waste can contaminate waterways used for irrigation, as well as kitchen counters and grocery store shelves. As a recent Pew Commission Report on industrial farm animal production noted, untreated animal waste harboring pathogens contaminates air, water, soil, and crops. Farm animal waste was the identified cause of a 2006 E. coli outbreak in which infected spinach killed three people and sickened hundreds of others. He also made the point that following a plant-based diet reduces the number of animals on farms, thereby reducing the threat of foodborne illness. 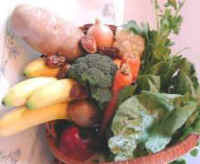 Vegetarian diets also help lower the risk of heart disease, obesity, diabetes, and other chronic illnesses. After the event, the tomatoes were donated to Manna Food Center in Rockville, Md. The center serves 2,300 hungry families and elementary students in Montgomery County, Md.